The original plan was to do some Blue Crabbing. This would give me a break from fishing and I would also be able to clear out some fish carcasses from my freezer so I could get some ice cream. Unfortunately, the Blue Crabs were nowhere to be found. Fortunately, a cooperative Horseshoe Crab cruised by and volunteered to be in my video. 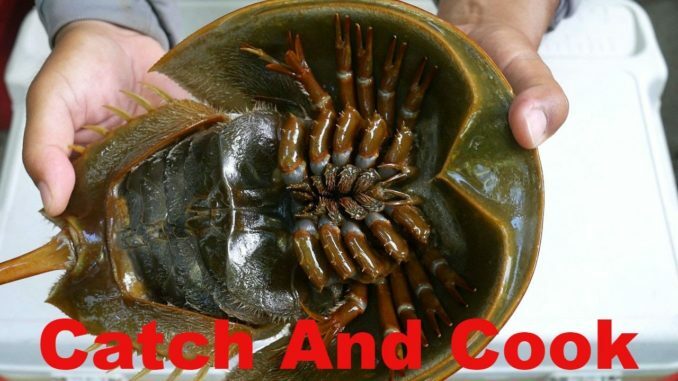 Horseshoe crab fossils have been found in strata dating back 450 million years ago. The only place that I have seen these eaten were in South East Asia. One of the common recipes seen at the markets was a Horseshoe Crab salad (Yam kai meng da). They basically roast the Horseshoe Crab, dig out the roe and fat and mix with Thai Mango salad. This is all put back into the shell of the crab. Bon Appetit. Tidal River Bass Fishing (Chickahominy/James) Swim Jig & More!! !